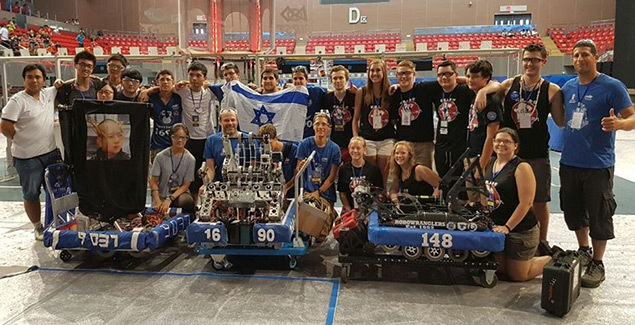 I’m very proud of our Binyamina Sci-Tech school’s Robotics team ORBIT #1690 and their robot, Skyzer, who roared to second place at the International FIRST Robotics Competition finals in China, and received the special Inspiration Award. This is their eleventh year participating in the event. FIRST (For Inspiration and Recognition of Science and Technology) is the initiative of Dean Kamen, a prolific American inventor who is best known for inventing the Segway. His goal – to develop a global culture where teens dream of becoming scientific heroes. 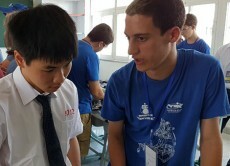 Every year Kamen and his team come up with new game challengers, with teams of high school students and mentors work during a six-week period to build game-playing robots that weigh up to 120 pounds (54 kg). 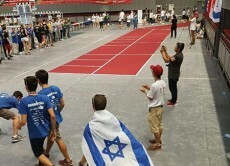 Binyamina Sci-Tech’s robot – or rather the teams behind the scenes – competed in a rapid game of basketball, with each team’s robot having to throw a ball into the other’s hoop. Our team and its smart robot won an amazing nine out of ten battles. See the robots storming each other’s basketball hoops in this interview on Israeli television with team leader Segev Huly. “It was a great experience – it’s a sport, it’s learning, it’s everything! I have a wonderful sense of Zionism; we flew to China to represent Israel with a robot. We came to learn about the Chinese and to teach them about our project. We showed off Israel’s capabilities to the world, and when you have such achievement they think, Wow! Israel is really amazing! We had six weeks to design and build our robot. It was a huge investment of time, we worked day and night. If you weren’t crazy about robotics, you wouldn’t do it.